– Q – I have had Musette for five years, and during that time traveled considerably with my job. Musette and I moved to Virginia in June 2002. I do not travel as much, but must go hom to check on my Mother periodically in North Carolina. Now when I travel, even though she has a pet sitter, she has started pooping on the rug once a day instead of the litter box (still pees in the litter box). Since my last weekend trip, she has started pooping on the rug once a day even when I am home (usually at night when I am asleep). Her litter is cleaned every day; she gets plenty of food and drinks plenty of water; she get s a great deal of play time. I need some advice on how to stop this new bad habit, or some advice as to why she is doing this. If it was just when I am out of town, I would say it is because she does not like to be left alone at night; but now that it is happening when I am in the house, I am at a loss.Please help me to help her — she is a very sweet, very playful cat. 2. Put her in a Tokyo cage with food, water and a litterbox for 3 or 4 days to retrain her, or confine her to a smaller room such as a bathroom for the same reason. Let her out to play with you but put her up when you go to work or at night for those few days. 3. Try a different litter; if you are using clay try clumping, etc.You need to nip this quickly as the longer she continues the harder it will be to break her of this new habit. 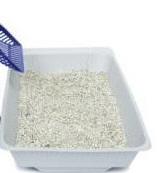 Please read the article at the following URL as it deals with litterbox problems. Although it is aimed at the multi-cat household the methods for correction are the same. for the last few days my cat has been pooping on the bed in my room, he has a clean litter try and is still weeing in the litter try. he always has food and water down and has all the attention he want.